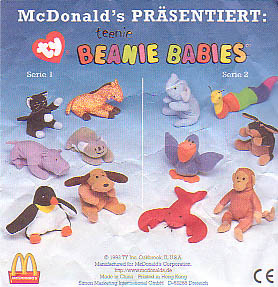 McDonald's Teenie Beanies from 1998 The 1997 Teenie Beanie promotion was such a great success it of course had to be done again the following year. 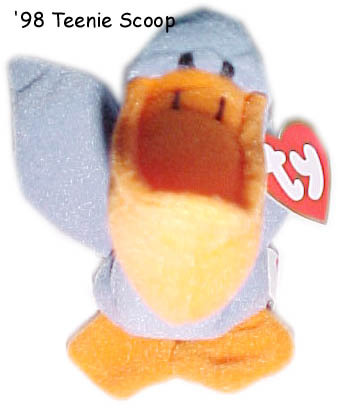 This second promotion ran a total of twenty-eight days, it lasted from May 22, 1998 to June 18, 1998. 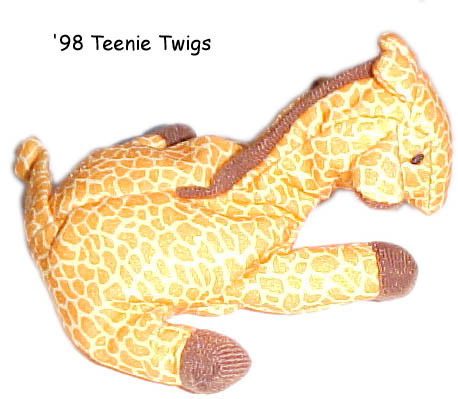 This year 12 Teenie Beanies would be given away instead of 10 like the previous year. 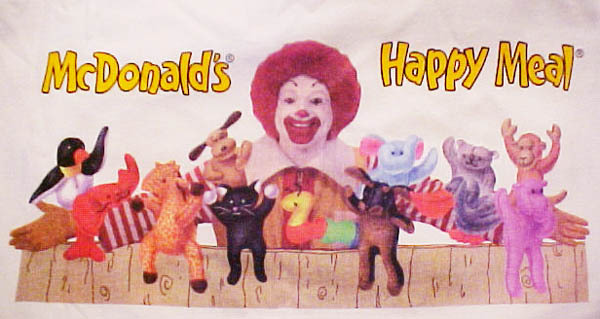 Happy Meal Bags!Click for larger Image! in their pockets, on my bed. 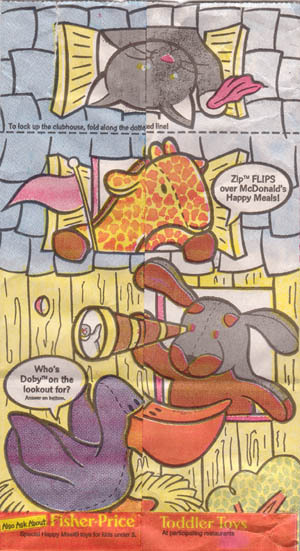 There were a lot of different advertising posters and banners created for the promotion, on the right is one of the posters that was displayed at the McDonald's in some Walmarts. The poster is make out of a vinyl and measures 36 x 50 inches. The poster is also double-sided so it coul d be places in a window or hung from the ceiling. 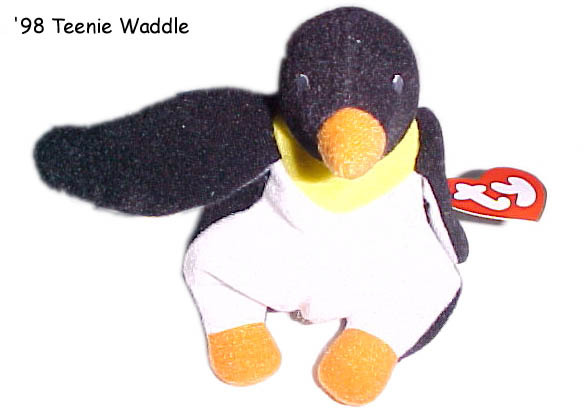 Click for a larger view! 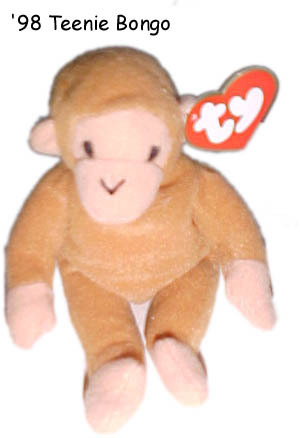 This year was the first year extra promotional items were available from Ty to McDonald's employees. Employees had to order them if they wanted them. 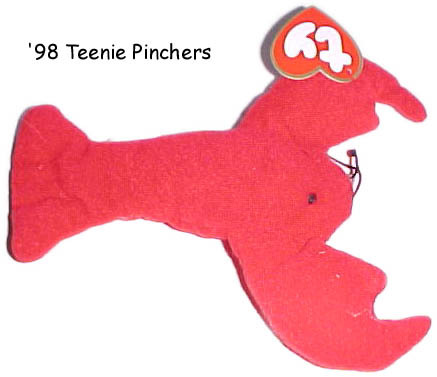 These included lapel pins with the Teenie Beanies featured on them and T-Shirts. There were a total of 12 pins featuring the 12 Teenies being given away this year! 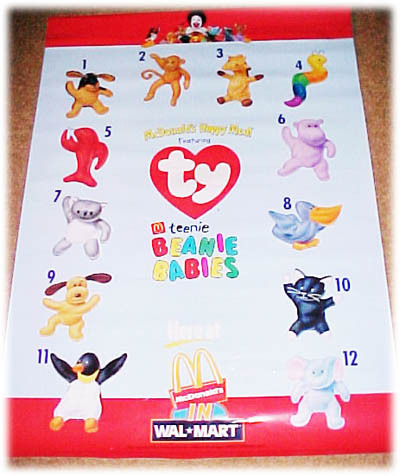 Each pin had a small box that read "Teenie Beanie Babies", with the Ty and McDonald's logo. 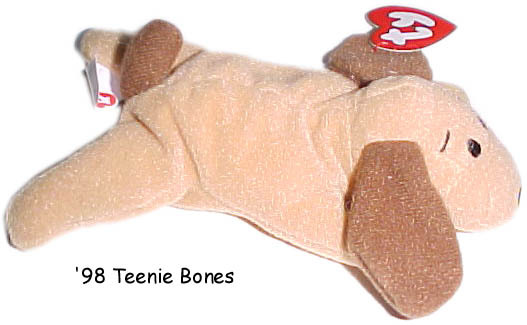 Another pin/bu tton that was made to promote the event read "Teenie Beanie Babies 1998," and had the silhouettes of the different Teenies surrounding the outside of the pin. 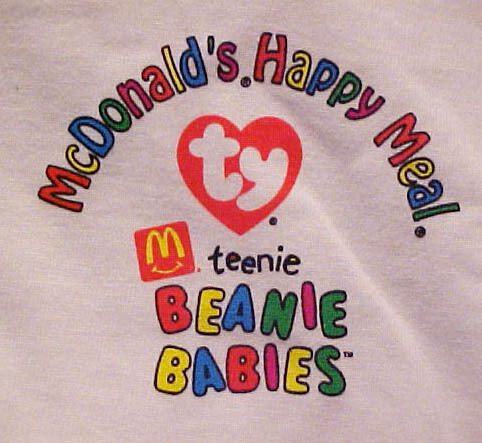 As a promotion McDonald's distributed Media kits to the media to use for newspapers and news articles about the Teenie Beanies, this year media kit was a white box with a cubbie for each Beanie to sit it, on the inside lid of the box is a picture of each Teenie! Click for a larger view of the Media Kit! 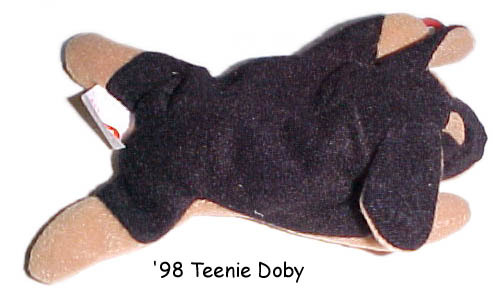 Germany also distributed their own selection of Teenie Beanie pins to employees in 1999 that were of the s ame US Teenies given away in 1998. There are a total of 14 pins, twelve of them being the Teenies that were distributed in Germany this year a nd the other two each featured the heads of the Teenies on a larger round pin. 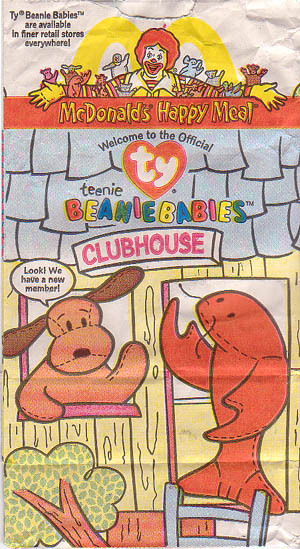 The inside of these two read, "Teenie Beanie Babies 1999." Each German pin carried the German flag on it somewh ere! 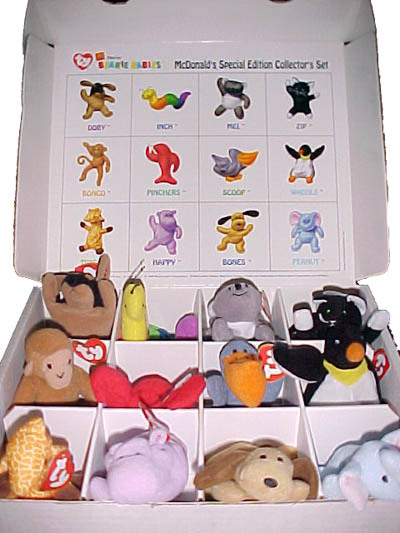 When Germany did this same Teenie Beanie promotion the names of Happy and Bongo were changed to Percival and Mitch!